New Chemistry - ExSyM - Exelus Inc.
Styrene is made conventionally by first alkylating benzene with ethylene using a zeolite catalyst. The resulting ethylbenzene (EB) is then catalytically dehydrogenated to styrene monomer (SM) The dehydrogenation reaction is favored by low pressures and is generally conducted under vacuum. The overall reaction is endothermic with heat supplied by steam, injected at 900°C into the adiabatic reactors. A major problem with the conventional process is that it consumes a large amount of energy in the second EB dehydrogenation step. An alternative route to styrene monomer production involves using toluene and methanol as lower cost raw materials. The primary reaction is the alkylation of the side chain of toluene with methanol to produce SM directly in a single step with co-production of hydrogen and water. Researchers have been attempting to develop this route for the last 35 years but it has been difficult to devise a catalyst with the yield and selectivity to make a commercially viable process. By combining elements of process design, reaction engineering with advanced catalyst science researchers at Exelus have developed a new toluene-methanol based SM process called ExSyM that allows significantly higher selectivities of EB/SM (>80%) at 425°C and 1 atm pressure. This has been achieved mainly through careful optimization of active catalyst sites, innovative reactor engineering and process design which have significantly reduced methanol decomposition rates and enhanced conversions. As a result, the new ExSyM process system is easily able to achieve a quantum jump in performance over other catalyst systems designed for the side-chain alkylation reaction(SM) is a valuable chemical commodity used in many plastics and synthetic rubbers. Global production is estimated around 25 million metric tons per year. Raw materials constitute about 90% of the final cost of production. Switching to lower cost feedstocks has the largest possible impact on the economics of the process. 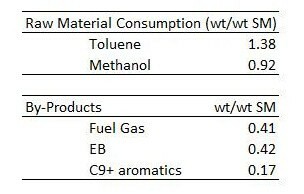 The raw material savings are obtained by switching from ethylene and benzene to methanol and toluene. One of the primary drivers of energy savings in the new process is eliminating the high-temperature dehydrogenation of EB. This step in the conventional process uses large amounts of superheated steam to provide the endothermic heat of reaction and adds very significantly to the capital cost of the plant. The reaction endotherm for the side-chain alkylation reaction is about half as large and this combined with fewer processing steps results in substantially lower capital investment compared to the conventional technology.